﻿ Hotel Shangri-La, Kota Kinabalu | FROM $41 - SAVE ON AGODA! "The hotel is located at a good location." 6 travelers are looking at this property right now | 5 travelers have booked today. Have a question for Hotel Shangri-La? "The breakfast is very good." "Love the helpful staff and cleanliness ." 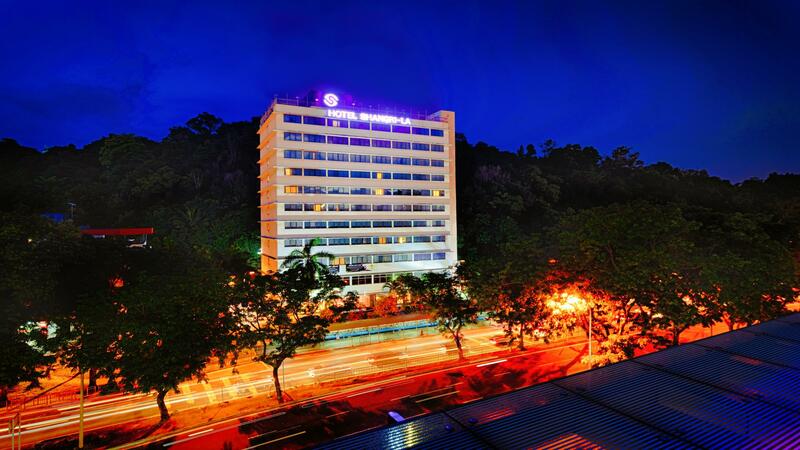 Hotel Shangri-La is in the heart of the business district and entertainment spot, offering comfortable and affordable accommodation with panoramic views of Kota Kinabalu. The property is located 10 minutes away from Kota Kinabalu International Airport and is of walking distance to an array of restaurants serving sumptuous cuisines such as Japanese, Thai, Chinese, Indian, Malay, and seafood. It's central location makes it easily accessible to all major shopping complexes, Gaya Street Sunday Market, Night Market, and Jesselton Point Jetty which provides a 20-minute boat ride to the famous islands of Tunku Abdul Rahman Marine Park. Guestrooms are of a reasonable size and come either with double bed or twin bed and standard amenities such as a working table, air conditioner, minibar fridge, cable TV, bathtub, hair dryer, and free Internet access. The hotel features a restaurant and bar that serves international food and beverage during breakfast, lunch, and dinner with ample free parking space for guests. "Such a great location, 5min to Filipino market rm4 by grab c..."
Very comfortable room with complete amenities at affordable price with wide variety of breakfast selection. Will definitely stay again if back in KK. Staff and room were great. Breakfast - ordered room service once that was not so great, looked over the buffet but didn't try it. biggest problem was the internet was not strong enough during peak times, had a hard time connecting. The hotel is located at a good location. There are many restaurants and convenience store located around the hotel which is open 24 hours daily. Nice local seafood restaurant is just a few minutes walk away from the hotel. The hotel is clean and nice. Its worth the money. Quite Impress with the hotel condition even its old building but they had maintain it well. They do renovated the bathroom with modern style. However, the hotel still use old wooden furniture which i think it is the high time to replace it with new one. The pillow case also need to be change because i can see it was being washed too often and already shabby. The window also very high and it is difficult to you to see the nice view from you room but still ok. Overall it was nice to stay here. We enjoyed our stay in Hotel Shangri-La. The location is just perfect for us to explore K.K. We can walk to lots of places within 15 mins. Room was decent and clean, AC, Mini Bar, Hot shower.....The breakfast was great! We even watched the dancing lion show at the lobby on Chinese New Year! It was so nice to have the festival feeling! Thank you! Staff is very friendly... Location is very good.. This was the best accommodation. A real home away from home. I had a wonderful view and the breakfast each morning made food for the rest of the day - well who needed anything more. This hotel had the lot and gave you the lot. A pleasure to stay. Booked a Deluxe King room. Hotel receptionists were well trained and friendly. Hotel checking in was smooth and super fast. My room was located on the 9th floor. The room was superb and the toilet was exceptionally clean. Housekeeper did a fantastic job in maintaning the cleaniless in the room and toilet. The view from our hotel window was absolutely stunning, enjoying watching KK city during the day & night as well. Food quality & taste in the Ala Carte menu was ok, could improved a little more. However, buffet breakfast was so good and delicious too, a wide array of food to eat. Last but not least, if you're planning visiting to KK, this is a hotel definitely worth checking in, trust me, you won't regret it. Two Thumbs Up !!! This hotel is shown 3 stars on agoda website but it’s worth than a 4 stars . The building is oldest in kk but the facilities are still maintain and clean nicely. Just a little bit not perfect , no hair dryer , and lower floor a little bit noisy , but overall is great ! Loved that the rooms were clean and comfortable with all basic amenities provided. The only set back was the area surrounding the hotel which had too many massage parlours and night spots which can be a little uncomfortable for lady travellers. However, since we stayed just for a night before our flight the next morning, it was fine. Breakfast spread was also good. Staff were friendly and helpful. Good hotel. Worth the money paid. Nice place yo stay. Everything is nearby. I stayed for a week,and was glad I chose this hotel. Such a great location, 5min to Filipino market rm4 by grab car. Free parking is available. Room is spacious with comfy bed and good quality bed linen. Breakfast is tasty with good spread. Overall, very good hotel to stay in KK. Well maintained hotel, king bed room is big and clean. But the room sound proof is a bit disappointed. Happy with free hotel parking lot even not many but is good enough at the business central to get free hotel parking. Breakfast is quite nice. Great location in the centre of the city - 15 minutes walk to the waterfront (though you have to cross a very busy road first). Fantastic breakfast in their large and pleasant restaurant. Room was clean and comfortable. Staff were friendly but gave inconsistent information. Non-stop Christmas music in the foyer and corridors was very annoying, especially when I could hear it all night in one of my rooms. That room also had no wifi. My second room was quieter and had good wifi. Internet speed really worst, even though connected to nearest WiFi port. Tested running a speed test on WiFi, ping speed around 59-70ms which is very slow. Please improve on this because business travellers really depending on WiFi and service provider signal. Even can’t get much signal to use our own hotspot. That’s why we really depend on the WiFi from the hotel. But others really good and keep it up. Thanks. Location is perfect, most of attraction places are walking distant. Breakfast is awesome and staff are friendly.